Note: This review has been superceded by a fresh look that compares the C by GE smart LED bulbs to a number of competing products. You'll find the new review here. GE’s C by GE smart LED light bulbs are outfitted with Bluetooth radios, as opposed to ZigBee, Z-Wave, Wi-Fi, or something else that would require a hub (or a router) to control them. The upside of that design choice is that you don’t need to buy anything beyond the bulbs. The downside is that you can only control them locally. You can’t turn your lights on or off from afar, you can’t program them to turn on and off according to a schedule, and you can’t integrate them—as smart bulbs, at least—into a broader connected-home system. GE recognizes those limitations will be showstoppers for some, so the company’s roadmap includes adding features to the bulbs down the road, including compatibility with the Wink hub (GE was an early investor in Wink, and the company sells other LED bulbs that work with it). If those issues don’t bother you, or if you can wait for GE to deliver on its promises, the company is selling its new bulbs at a solid discount: An introductory price of $50 for a four-pack (two C-Life bulbs and two C-Sleep bulbs—I’ll explain the difference in a moment). That price will rise to $70 when GE’s promotion ends. (Update: The current price is $75 when ordered directly from GE). GE declined to provide us with a specific date, nor would the company give us a hint as to whether or not you’ll be able to buy the bulbs in other quantities down the road. (Update: The bulbs are now also available in two packs with one of each bulb for $40.) That makes it hard to know how much they expect to fetch for each bulb, which is important because The C-Life and C-Sleep bulbs have very different capabilities. 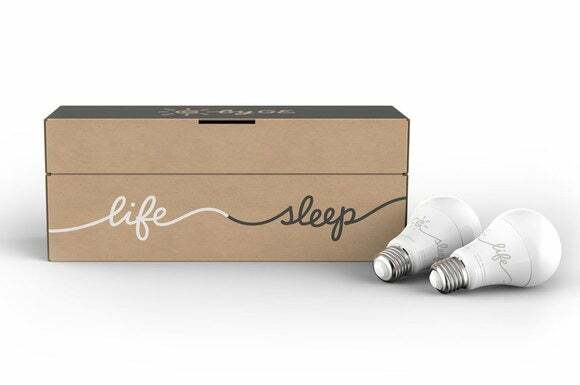 GE’s C by GE starter kit will include two C-Life and two C-Sleep bulbs for the introductory price of $50. Both bulbs are attractive and look very much like ordinary A19 incandescent bulbs, except their lower half looks to be fabricated from porcelain (or something similar). The top half of the bulb is frosted-white glass. A disclaimer printed on the lower half advises that the bulbs shouldn’t be used with dimmer switches (they have their own onboard dimmer mechanism), and that they are not for use in enclosed luminaires. I gather this second restriction is due to heat: the lower half gets too hot to touch with your bare fingertips. They can be used in damp locations, however, so they should be okay in a bathroom. I already mentioned that you can’t use these bulbs with dimmer switches, but here’s another limitation that impacts all “smart” light bulbs: If the lighting fixture or the outlet on the wall is controlled by a switch on the wall, you can’t control any bulb that’s plugged into that fixture or wall outlet if the switch is in the off position. By the same token, if you screw a smart bulb into a lamp with its own on/off switch and set the switch to off, you’ll never be able to turn the light on with an app. The best way to achieve a truly connected home is to put the intelligence in the switch or dimmer that’s in the wall—that way, you can control the light the old-fashioned way, by flipping a switch, if that’s more convenient than setting it remotely. The C-Sleep bulb is more interesting than the C-Light. It produces a maximum brightness of 730 lumens while consuming 11 watts. In addition to being dimmable (from the app, that is), it can produce white light in three color temperatures: Its AM setting produces a crisp white light, its Day setting changes to a closer-to-full-spectrum light, and its PM setting produces warm, orangeish-yellow light. GE didn’t provide specific Kelvin temperatures, but we were informed for an earlier story that the C-Sleep ranged from a very warm 2000 degrees Kelvin to a very cool 7000K). You can use the app to activate the AM, Day, and PM modes manually, or set the app to “follow-the-sun” mode and the bulb will automatically change its light temperature according to the time of day: coolest in the morning and warmest at night. I aimed the C-Sleep bulb at the steel panel covering my in-wall cabling home-run for these shots. The light reflected is, from left to right, AM, DAY, and PM. The C-Life bulb is slightly brighter, producing 800 lumens while consuming the same 11 watts, but its color temperature is fixed at 2700K. 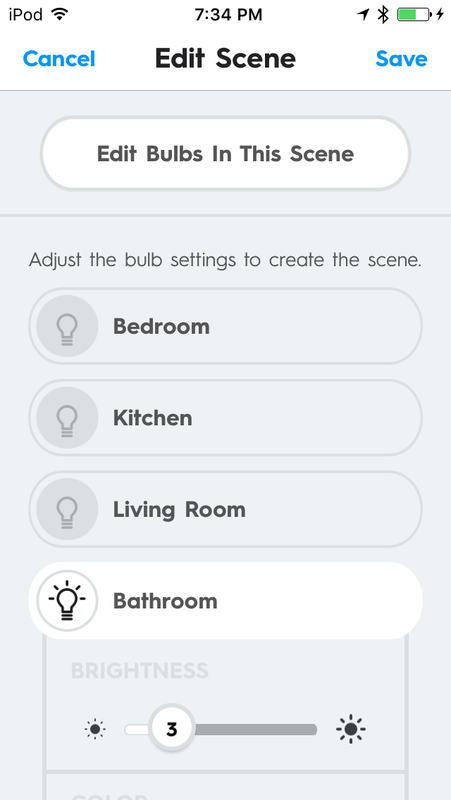 You can turn both bulbs on and off by touching a large bulb icon in the app, and you can drag a slider left and right to dim or brighten the bulb on a scale of 1 to 10. 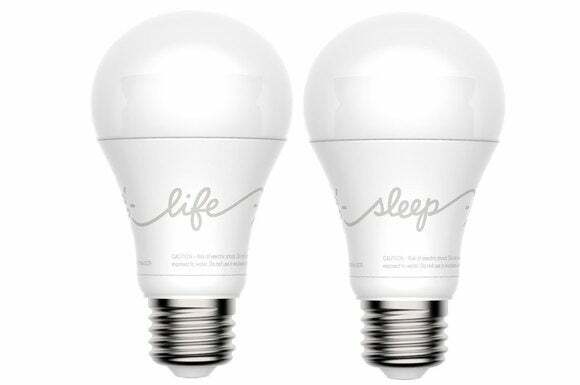 The bulbs are extremely responsive—turning them on or off, dimming, and changing color temperature (the C-Sleep only) happens nearly instantly. 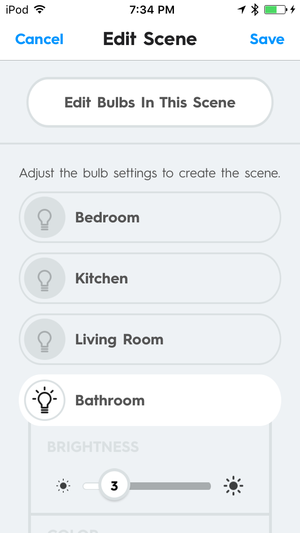 While you currently cannot control the bulbs with third-party controllers or apps, and you can’t schedule lights to turn on and off according to a schedule, GE’s app makes the most of what the bulbs can do by letting you create lighting scenes and lighting groups. Scenes are essentially one-touch buttons that set multiple bulbs to preset values: on, off, brightness level, and color temperature (for bulbs that have that capability). With this Bedtime scene, one touch of a button turns three of the bulbs off and sets the bathroom bulb to a low brightness and warm color temperature. I programmed a Bedtime scene, for instance, that turned off all of the lights except for the bathroom, which I set to a PM color temperature and a level 3 brightness. You could also program a Panic scene that turns on at least one light in every room of the house if you hear a bump in the night. The app makes it very easy to create scenes, guiding you through each step in the process. The app would be even better if it let you create scenes with groups, and not just individual bulbs, so there’s room for improvement. Speaking of groups, they are exactly that: You can assign any number of bulbs to a group so that they can all be controlled at the same time. Say you have three pendant lights over your kitchen counter: You’d probably want to turn all of them on at once instead of one at a time. Creating a “pendant” group would do that for you. Or you could create an “outdoor” group and install bulbs in your front and rear porch lights. Individual bulbs can also be assigned to multiple groups, so that if you wanted to light the first and third pendants but not the center one, you could create a group called “outer” or what have you. But assigning bulbs to groups doesn’t prevent you from controlling them independently, either from within the Group screen or by tapping on Bulbs (icons for both appear at the bottom of the home screen). GE’s C by GE bulbs produce light of excellent quality, and GE did a great job designing the app that controls them. You won’t like these bulbs if most of your lighting is controlled by wall switches or dimmers, unless you tape the switches into the “on” position (and that’s just going to look ugly). Not being able to schedule lights to turn on and off automatically, or to integrate them into a broader connected-home system are less significant shortcomings—especially if you don’t already have a system—but I hope GE works quickly to change that limitation. It’s much more convenient to have a door sensor trigger your lights when you arrive home at night than it is to fumble for your smartphone. But there are plenty of other times when controlling your lights with your phone is super useful. C by GE has some important limitations you should be aware of, but it's generally a very good lighting solution for the connected home.